The Angel-Share Project is the brain child of owner, Ryan Maloney, who wanted to build partnerships with some of his favorite wineries to create interesting, delicious and cool wines for his Julio’s customers. Ryan is not looking to create private labels; rather these projects are intended to show a deeper partnership with wineries and allow us to give credit to these wineries for their efforts and participation. With this vision in mind, Ryan tasked the Wine Team to seek out and craft wines that are exciting, value driven, and (most importantly) flavorful. In February 2016, Ryan jump-started his wine campaign by sending Ray and I to Central Coast California for our first wine blending expedition. 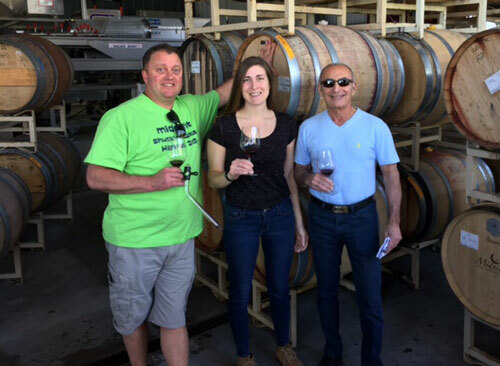 The inaugural trip was more fruitful than we could have ever anticipated as we were joyfully received by three of our favorite wineries in California. That experience has now evolved into The Angel-Share Project; we humbly offer to our customers craft wine blends for your drinking pleasure.